WatchmenComicMovie.com Forum • View topic - Favorite character? Who is your favorite Watchmen character? Post subject: Re: Favorite character? This is hard... But I think my favorite is Blake. And the funny thing is, I am basing that on how I think he is in private. When "in character" he is this badass guy, but I am sure that when he comes home he breaks down. Not totally of course, but I can picture him smiling, with his flamethrower, in Vietnam at day, but when the fighting is over, and he is alone... no more smile, no more gleam in his eye. Just a sad man, who knows that everything is just wrong. Like Dan when he sits besides his suit, smiley pin in his hand. But then again, Dan is a great character as well... and so is Rorschach. And Jon... Laurie is the one character I haven't made up my mind about yet. Because it almost feels like she is barely in the GN to me. 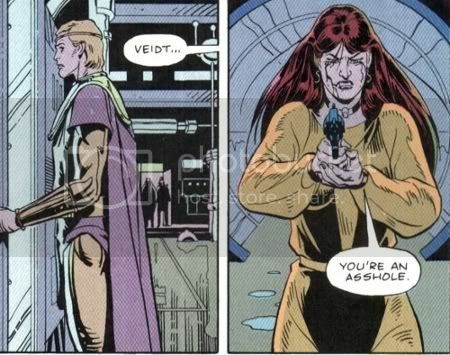 Veidt is... actually a pretty cool character. But my vote goes to Blake. "Well, what do you expect? The Comedian is dead." Definetely Laurie. She is the most emotional of the Watchmen characters. (Not to mention the only female main character, which makes her special in a way). I don't know why (according to the poll on this thread) she is almost the least favorite character. Can anyone give their opinion on that? It's just because everyone is enamored with Rorschach. It's not really fair to pick a favourite character. I'm sure most people will at least grudgingly like all of them. Well, she's sorta like a female version of Dan. Y'know the supposed "straight" hero, without any mental instability or superiority complex. The two of them have the most trivial personal issues of all. I dunno...she's my favorite, too. I think she brings a down-to-earth common sense to the gang o' guys; and like her dad, she has a tendency to bluntly state her views and hit straight to the heart of any matter. I think when I voted I had a very hard time choosing between her, Dan, and Rorschach. I like them all for different reasons. ARCHIE. 99 Accessories, but a dash lighter ain't one. I love Eddie Blake just for some of his badass lines. At work a week ago, I was helping a freind put some stuff back on the shelves. (I have what he dubs 'The Sneakiness') I snuck up on him, grabbed his arm and said "DROP THAT CAN YA LITTLE FREAK!" e must have found God or something, as he was stumbling down the alsie screaming "Oh God! Jesus!" If I could change my vote.....I would choose the Comedian. Rorschach is much simplier than him and Ozymandias. Ozzy and Blake are extremely interesting and complicated character who can be argued about for years. I'd go with Blake though because he has a very true view of the world and he's just more....appealing? I love you. Come away with me. I agree with you that this is made of win. The Comedian, He wasn't a good person per se but I liked him despite the heinous stuff he did. I liked his world view and how he saw to the center of things. Also my Ma used to read me it as a bedtime story when I was a kid and The Comedian was my first crush, try sharing that with your Take That loving friends! "My first crush was Eddie Blake, does that make me twisted?" Location: She is all States, and all Princes, I, nothing else is. Your...your mother read you Watchmen as a bedtime story? What a great topic to have my first post. If I would have to choose of course it's Rorsach the badest of all the bad asses. This﻿ is bob, Copy and paste him, and soon he will take over Youtube, WCM & The Internet. Yup, I was about 10 or 11. You've got much better taste in men, I'll say that much.